Updating your bathroom doesn’t get any easier – or more affordable. There's no need to hire a contractor – you can install this bathtub screen yourself! Unlike a bulky shower curtain, the Siena-style (square corner) bathtub shower screen door lets in plenty of light. The pivoting door won’t get in the way of using or cleaning the tub. And unlike a sliding door, the trackless bottom just wipes clean – no scrubbing! The Siena bathtub glass screen features a pivoting door. Sturdy metal towel bar comes in chrome finish. We do not ship to PO Boxes or APO/FPO Addresses. We also do not ship these items to Alaska and Hawaii. 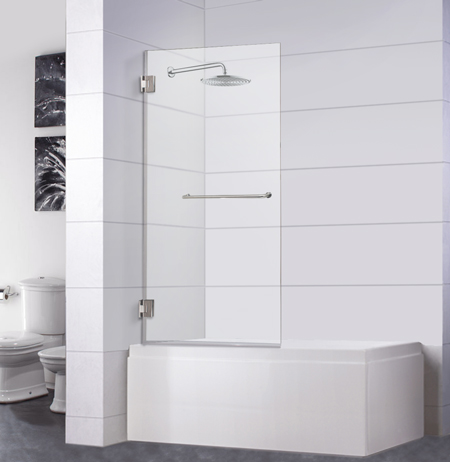 Visit our Frameless Tub Screens page to customize your tub screen.